You can use the ALDU1 and CABL2 together for both datalogging and reprogramming. Just get you a free trial version of TTS DataMaster and then get you a copy of TunerCat with the proper definition. Do I need an adapter to get the chip to fit in my TBI ECM? For chip swaps on your TBI computer, you’ll probably want to use the G2 adapter. Most folks use an S2 socket snapped into it along with the C1 chip. They’re pretty easy to install, or I can do it for you. The chip you’re looking at comes out of that little plastic holder. Squeeze it gently from the sides, and then use like a jeweler’s screwdriver to lift the legs away from the sides of the holder a little bit. It should snap out of the bottom. Worst case, you can cut the plastic support piece along the back of the chip, and it will come apart much easier. Then you can read the ‘stock’ chip using the Burn1. Key thing though is that to reprogram a chip, you’ll need to use a Flash chip like the C1, and you’ll want to use a G2 adapter to make fitment easy. They are 28 pin rather than 24 pin. I am using ALDU1 and CABL1 and I cannot get my PC or Laptop to connect to my ecm. When using it to connect to the 165, make sure the vertical switch (as you look at it to the right) is in the ‘up’ position. When working with the 730, have it in the middle position. – Under Windows Control Panel, make sure you have the USB/Serial device set up to COM3 or COM4. – Under TunerPro Tools/Preferences, make sure you have it set up as a ‘Max232/etc’ on the corresponding COM port. – Under TunerPro ALDL/Datalogging section, make sure you have the correct *.ads file selected. This will either be the 1227165_6E.ads or 1227730.ads file. What does the switch on the ALDU1 do? The switch on the back of the ALDU1 changes the resistance between pins A and B on the ALDL interface cable. The topmost position places 10k ohms between the pins. Some ECMs require this 10k resistance in order to connect to the ALDL datastream (some 1227165 are an example). The middle position opens the connection between A and B (infinite resistance). This is the “default” position. Most cars can be datalogged in this position. Cars that require 10k to connect can be switched to this position after connection. The bottom most position shorts the connection (0 ohms). Most GM ECMs dump trouble codes when pins A and B are shorted. This switch position makes doing so simple and convenient when a PC is not available. What do I need to do to use the winALDL program with ALDU1? Set the baud rate to 4800 within the WinALDL program. While looking at the ALDU1 box, set the vertical switch to your right, and switch it ‘up’ (10k mode). Set the COM port selection in WinALDL to match what it set up to on the USB driver under the control panel. Select the ECM type in WinALDL which matches your ECM. Make sure the ALDU1 is connected to the laptop prior to starting the software. Turn your key off, connect the ALDU1 to the car, and start the software. Turn the car on, it should connect. Does the USB AutoProm require a driver, and if so, where do I get it and how do I install it? The USB AutoProm does require a driver. You can download it from http://www.moates.net/. Instructions on installation can also be found there. Without the driver, the AutoProm will not function. Note that the serial version does not require any special drivers. Is there a users manual for the Autoprom? Yes, Its on the Moates.net website here. What does the vertical switch on the back of the Autoprom do? The vertical switch on the backplane of the AutoProm changes the resistance between pins A and B on the ALDL interface cable. The topmost position places 10k ohms between the pins. Some ECMs require this 10k resistance in order to connect to the ALDL datastream (1227165 is an example). The middle position opens the connection between A and B (infinite resistance). This is the “default” position. Most cars can be datalogged in this position. Cars that require 10k to connect can be switched to this position after connection. The bottom most position shorts the connection (0 ohms). Most GM ECMs dump trouble codes when pins A and B are shorted. This switch position makes doing so simple and convenient when a PC is not available. What does the horizontal switch on the back of the Autoprom do? The horizontal switch, called the bypass switch, switches whether the PC communicates with the AutoProm CPU or directly to the ALDL interface hardware. When the switch is towards the serial or USB port, the PC communicates with the AutoProm CPU. This mode is used for changing data in the emulation buffer, for acquiring A/D data, and for ALDL datalogging in “AutoProm” mode (TunerPro only). When the switch is switched away from the serial or USB port, the AutoProm is in bypass mode. This mode allows the PC to communicate directly with the car through the ALDL cable. This allows the AutoProm to function as a simple ALDL cable. Use this mode to communicate with your OBDI vehicle using most ALDL data acquisition software such as WinALDL, CarBytes, Datamaster, etc. What is the firewire connection on the rear of the AutoProm for? The firewire connection on the backplane of newer AutoProm units is used for connecting (via a special connector available from moates.net) the 3 channel A/D module. What chips can I burn and read with the AutoProm? Why does the USB version support writing 27SF512 chips, but the serial version does not? Because of the simplicity and size of the USB connector, there is more room on the hardware layout for the electronics necessary to write to 27SF512 chips. The serial version does not have enough room for the required components. What chips can I emulate using the AutoProm? 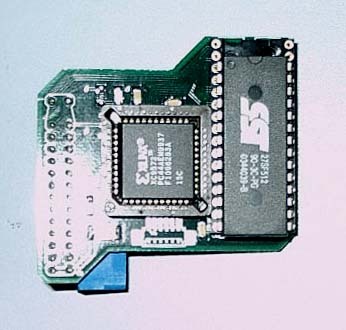 The AutoProm can emulate virtually any chip up to 64MBit in size (64KB) with 28 pins or less. What are the 3 additional channels of analog to digital (A/D) conversion for and how can I make use of them? With the AutoProm, you can monitor and datalog up to 3 channels of analog data. This can be used to monitor external temperature sensors, voltage levels, etc. To make use of the this feature, you need the appropriate interface connector available from www.moates.net. Once connected, you can use TunerPro to monitor the data or datalog the data in the normal ALDL stream (see the TunerPro help documentation). I’ve hooked up the USB AutoProm to the computer, but the software cannot find or detect it. The USB AutoProm requires a driver to be installed. See the appropriate question in this FAQ for more information on finding and installing this driver. Emulation does not seem to work. The SES light flickers and/or the cooling fans come on when I turn the key on. There are a few things to try or check. Make sure you do not have a chip in the ZIF adapter. At no time other than reading or writing a PROM should you have a chip in the AutoProm ZIF. Make sure your checksum is correct or disabled if your ECM requires it. Checksums can be disabled on GM ECMs by uploading 0xAA to the Mask ID byte. Make sure the chip header is installed in your ECM correctly. Make sure pin 1 is oriented correctly and that all pins are making contact. This may require making adjustments to your ECM chip adapter. If you’re using a C3 ECM (7747, etc), make sure you’ve soldered in your chip adapter correctly. Make sure your car runs as expected from your stock (or known-good) chip. Make sure your emulation header cable is not too long or in a place where electrical interference could be an issue. After uploading my bin to the AutoProm successfully, verification fails. There are generally two causes for this: 1) You have a chip in the AutoProm ZIF, 2) Your USB cable is bad or inadequate. Try a different brand or type of USB cable. I can’t seem to read or write a chip. What am I doing wrong? Make sure the chip is properly oriented in the AutoProm ZIF. Pin 1 should be towards the back (connection) side of the AutoProm, and the chip should be all the way towards the front of the ZIF, such that any unused pins are between the chip and the ZIF handle. I can’t seem to connect to my ECM with the AutoProm. If your AutoProm is in bypass mode and you’re using TunerPro, make sure TunerPro is configured to use “Max232” as the adapter interface. If you’re using a USB AutoProm in bypass mode with WinALDL, make sure WinALDL is configured to use 4800 baud. There are a few ECMs that cannot be connected to un non-bypass mode. Please contact Craig or Mark for more information if you continue having difficulties connecting. Could tell me how to connect with the APU1/ALDU1 step by step? Close all programs including TunerPro. Connect the APU1 or ALDU1 to the USB port and the vehicle ALDL. If using the APU1, set the horizontal switch to the ‘inside’ setting for use with TunerPro. Set it to the outside for use with WinALDL or DataMaster. For 8192, if using 1227165 ECM, set vertical switch to ‘up’ position (looking at it with the vertical switch to your right). For all other 8192, set it to the ‘middle’ position. If you want to ‘flash your codes’ set it to the bottom position and turn the key on. For 160 baud (older TBI, etc), set it to the ‘top’ position. Open up your Windows Control Panel, under ‘System’ and ‘Hardware’ and ‘Device Manager’ under ‘Ports’. Find the USB Serial Port, and go to the Port Settings tab. Go to the Advanced button, and make sure the COM port setting is either COM3 or COM4. Set the latency to 1. If having connection issues, you might try a latency of 5. Once settings are applied, hit OK and close out all Control panel stuff. Keep in mind that this will be valid and ‘keep’ for the particular USB port you are plugged into for next time. If you plug into a different USB port you’ll need to do this again for that one. Open un TunerPro, and go under the Tools/Preferences section. Go to the ALDL/Emulation tab. If using APU1 with the switch to the ‘inside’, select ‘AutoProm’ for datalogging device type. If using the ALDU1 or the APU1 with the switch ‘out’ then select ‘MAX232/etc’ as device type and specify the correct COM port assignment (remember this from the Windows Control Panel exercise, probably COM3 or COM4). Once set, hit apply or OK and close that window. Go to the Tools/ALDL-Datalogging/Setup section of TunerPro, and ‘browse’ for the correct datalogging definition file (ADS file). You may need to download it from the TunerPro website. The name of the file should tell you if it’s the right one. Once selected, you’re ready to go almost. Close TunerPro and open it back up. That’ll make sure all your options ‘stick’. If using APU1 with the switch ‘in’, you should see a message at the bottom of the TunerPro window indicating “Connected: AutoProm blahblah” whereas if you have the switch ‘out’ or you’re using an ALDU1, you will see ‘Hardware Not Connected’ and that is OK.
Go back to the Tools/ALDL Datalogging/Setup option, and now turn your key on. Click on the ‘Connect to ECM’ button. It should connect. If not, then something isn’t correct or something is wrong. Could be corrupt binary, bad connection, hardware problem, or something else. Some of the older 165 (pre-89) have difficulty, and you may need to upgrade to the 89 (6E) code. Some of the SyTy/late-model TBI trucks/LT1 stuff has problems because of a ‘silence mode’ command requirement. This is being worked, and should be fixed soon. Once connected (you’ll see the ‘connected’ indicator), you can monitor variables. Go to the Tools/ALDL/Datalogging menu, and you’ll see where you can show ‘Flags’, ‘Values’, ‘Dashboard’, ‘Traces’, all sorts of user-definable stuff. To choose values for your dashboard display, you can right-click and select something you want to show from a pulldown menu. How do I make an ALDL data recording with Tuner Pro? For ALDL data acquisition the AutoProm has two modes: Passthrough and AutoProm. Passthrough mode is set by placing the horizontal switch on the backplane away from the USB connetor. In this mode, TunerPro must be set to MAX232, since the AutoProm, when set to this mode, is just like any other ALDL cable. To set it to AutoProm mode, place the horizontal switch towards the USB port. In this mode, TunerPro must be set to AutoProm mode. The purpose of passthrough mode is to allow the AutoProm to be used for gathering ALDL data using applications other than TunerPro. In this mode you cannot make changes to the emulation buffer in the AutoProm mode. In AutoProm mode (again, set on the AutoProm itself and in TunerPro’s settings), you can emulate and datalog at the same time. How do I emulate with the Autoprom and Tuner Pro? Hit “update” in the respective item editor after every change to update the emulator RAM with the new data. Note that you may need to disable the checksum in your bin. This is done by changing the mask ID byte to 0xAA. More information on that can be found in the various tuning forums, including the forum at www.thirdgen.org/techbb2 (DIY PROM forum). What do I need to start tuning a Ford? It really depends on what you want to do and how you want to do it. The F1 and F3 adapters are plugged into the J3 port. You cannot change anything with these while they are plugged into the J3 port, you have to unplug them and use the burn1 to write the modified bin file to the adapter. These adapters “override” the stock programming and allow you to change anything you want ,and get your “tune” exactly where you want it. To do this though you really need a way to datalog, and a Wideband O2 sensor is a great help as well. The F1 adapter is designed for use with most EEC-IV processors, it doesn’t work with the 4 cyl turbos, and it does not come with a chip. The new F3 works with both EEC-IV and EEC-V processors up to 2003, it is switchable between 2 memory locations , giving you multi-chip capability. It also comes with chip installed and with the optional F2A adapter, can be programmed without removing chip. You also need some software to be able to edit your bin files, the bin file is the binary code within your PCM. Both Tuner Pro and EEC Editor support Ford stuff and work well with Moates hardware. You will need to make sure there is software support for your particular application. Another way to tune is with a emulator, basically with this device you can make changes while the car is running, this greatly simplifies the tuning process. Currently Moates offers the Ostrich, which will interface with EEC IV and EEC V PCMs using the FORDEMU. Also the Autoprom will work with only EEC IV PCMs using the F1. I have a 2.3 Turbo (PC1, PE, PF2, PF3, PK, PK1,etc) what do you have for me? 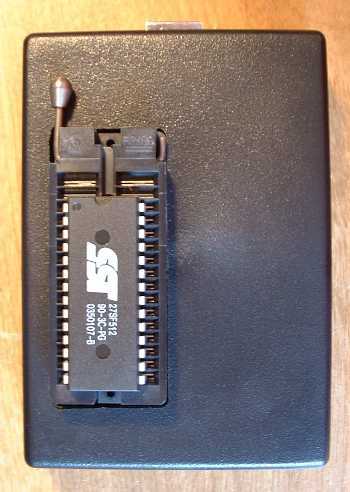 Typically folks have used the F2 adapter to override their stock EEC program via the J3 port. However, the F2 adapter is no longer available. The F1 adapter does something similar, but it doesn’t work with turbo type applications, only N/A EEC-IV (pre-96) stuff. So, I have the F3 and F4 adapters (single program and switchable). They will be made available soon. They will work with EEC-IV and EEC-V as well as the Turbo EEC-IV. 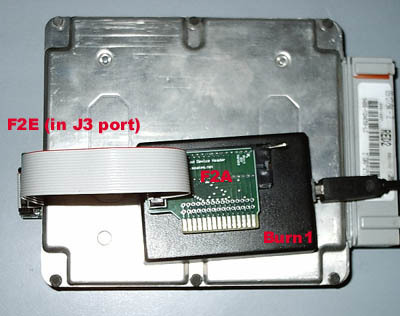 The Burn1 is a chip programmer, and is used to program the J-3 adapters via the F2A. The F2A is merely an adapter to go from the BURN1 to a chip adapter such as the old F2 or F3/F4. The BURN1 can also be used in conjunction with the F2A adapter. This is being redesigned so that it can be used with the APU1, and will be renamed probably to just the FA. It is used for a couple of different purposes. First, it can be used in conjunction with the F2E to read the ‘stock’ content from the EEC-IV and EEC-V computers. Second, it can be used to read chip modules such as the F1, F2, F3, F4, and others such as the TwEECer. The binary from these exercises can be saved and edited offline. 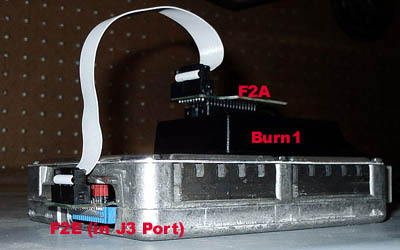 The BURN1/FA combo can also be used (as well as the APU1/FA combo) to program chip modules such as the F2, F3 and F4. This way, you go directly through the BURN1/APU1 interface via the accompanying software and USB interface. No need to remove the chip from the module. In all these cases, there is no desoldering involved. Just clean the contacts on the J3 port and stick the programmed adapter module (F3 or F4 in your case) in there. How do I know what bin file I need? What is a J3 port? It’s the port on the back of your processor that the adapter plugs into (see pic). Which way does the chip go into the socket on the adapter? The top of the socket on the F1 adapter has a notch in it, line it up with the notch on the chip facing the same way, the chip installed all the way at the bottom of the socket(see picture). What chip addressing do I use when programming a F2 or F3 for EEC-IV ? When programming for EEC-IV, you want to put a 56k binary from 032000-03FFFF. What chip addressing do I use when programming a F2 or F3 for EEC-V ? Does the F2E (EEC computer reading interface) use an external power supply ? No, its uses the USB port to power the PCM. Do I have to remove the PCM from the car to use the F2E ? No, it works either way, either on the bench or in the car. Is the F2E a stand-alone unit, will I need anything else to read the chip ? No, it is not a stand-alone unit, it is designed to work with the burn1 and F2A Ford programming adapter. How do I use the F2E ? Attach the F2A to the Burn1, then plug the cable that came with the F2E into the F2A, then the F2E to the cable, then plug it into a CLEAN J3 port (see pics below). What addressing do I use to pull out a bin from my EEC-V ? Which way does the chip go in to the socket? The top of the socket on the burn1 is the handle, line it up with the notch on the chip facing the same way, the chip installed all the way at the bottom of the socket(see picture). Follow the documentation on setting up a com port and installing the USB drivers in the documentation section on the Moates.net web site here. Can I use a Wideband O2 sensor in my factory harness? The wideband O2 sensor itself looks much like a standard O2 sensor. It does in fact install similarly, with the same threads. However, it requires a separate control box. It is a heated sensor which requires special heating rates and such, and can’t be controlled straight off of a factory harness. Instead, what you do is ‘add’ it to your exhaust, keeping the stock O2 sensor in place and adding the wideband sensor at another point in the exhaust system by cutting a hole and welding in a bung. Then for the control box, you use either the LC1 or the LM1. For the LC1, you can monitor it via the laptop and what-not, and for the LM1, it has a local readout which you can view. Both the LM1 and LC1 have a ‘serial’ output which can be used to either hook up to a PC for logging or to a gauge like the XD1. As a more advanced topic, if you’d like to ‘replace’ your factory O2 sensor with a wideband unit, you can use what is called the ‘simulated narrowband output’ of a unit like the LC1. To do this, you need to splice into your existing harness slightly and program the LC1 to match. The LC1 has two programmable analog outputs, one of which can be used to ‘feed’ the factory ECU. In any case, the wideband controller (LM1 or LC1) is a critical part which is needed. Where do I find support for TunerPro software? At the TunerPro website http://tunerpro.markmansur.com/, Mark has a nice F.A.Q posted there. Where do I find support for EEC Editor software? On the EEC editor mailing list http://groups.yahoo.com/group/eeceditor/. Where can I find information on using the Flash & Burn Software for the Burn1? This information can be found in the Burn1 Use document in the Documentation section of the Moates.net web site. Where can I find information on Chip addressing? This information can be found in the Using offsets when programming chips document in the Documentation section of the Moates.net web site. What chip addressing do I use when using the F2 in a EEC-IV ? Can the firmware of my Moates.net device be updated? There are 3 devices which can be reflashed in terms of firmware: APU1, BURN1, and Ostrich. Download the Firmware updater program and the correct firmware for your application from Moates.net, i.e AP_2_8_A.zip is for the autoprom, notice the “AP” at the beginning of the file. Click on the open file button, browse to the directory you downloaded the firmware and select it.